Schmidt JB, Gregersen NT, Pedersen S, Hansen DL, Worm D, Madsbad S, Astrup A and Sjödin A. 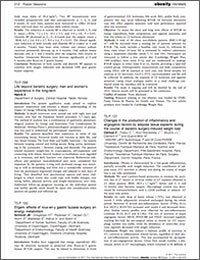 @ 2011 The Authors Journal Compilation @ 2011 The International Association for the Study of Obesity. obesity reviews 12 (Suppl. 1) (2011) 63–279. Ergem: effects of roux-en-y gastric bypass surgery on energy metabolism.